Whitwell football coach Randall Boldin pumps his fist at his Tigers score a two-point conversion to tie their TSSAA Class 1A state semifinal against the Greenback Cherokees last November. Updated with more information at 8:15 p.m. on Feb. 13, 2019. 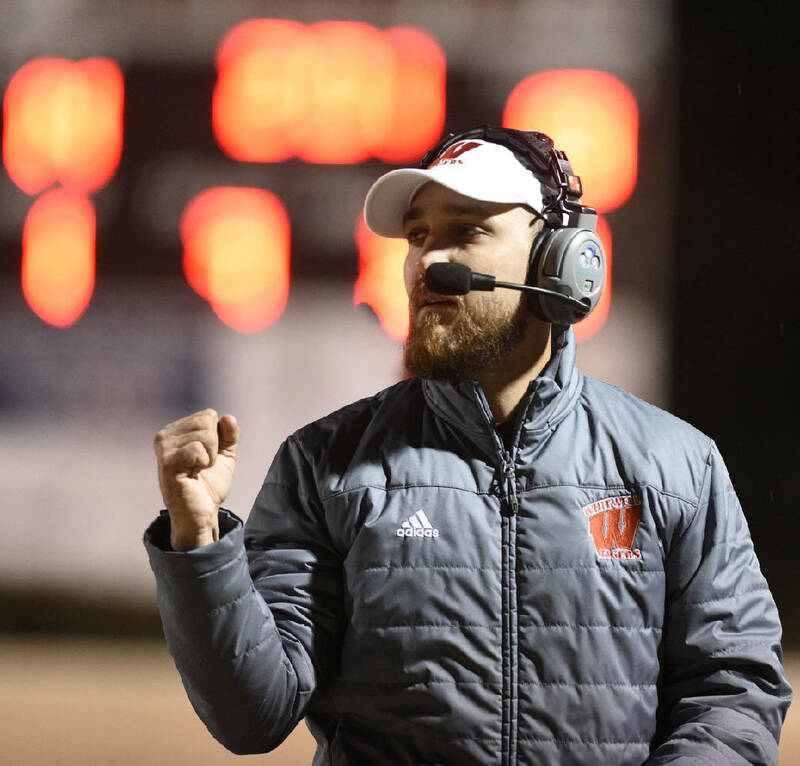 Randall Boldin, who guided Whitwell High School's football team to the Class 1A state championship last season, resigned Wednesday to take over the program at Waverly, his alma mater. Boldin, 34, had been the Tigers' head coach for just two seasons, compiling a 26-2 overall record, including last season's 15-0 run that culminated in the school's first state championship in any sport. "It's been one of the most difficult decisions I've ever had to make, and that's because of the relationships we built with the kids and the community," Boldin said. "The reason you get into coaching is for the relationships, and I feel like we made an impact from the high school level down to the little league. "The changing of the mindset in this community was huge for us. I think we did that. We let the community know we can be successful with a lot of hard work. We felt like this was a special place and that proved to be true. "Unfortunately there's an illness in our family that requires our attention back home, and it's also a chance to get back to my alma mater. Several of the coaches that I played for are now in charge there in administration, so it was a big draw to get to work for some of those men who helped shape me." Led by a group of nine senior starters, the Tigers set several school records — including most points scored — last season. Along the way to the state title, Whitwell beat eventual 2A state runner-up Trousdale County in the regular season on the road in overtime, snapped a 28-game losing streak to intracounty rival South Pittsburg, then rallied late in each of its final three playoff wins, beating South Pittsburg a second time (in double overtime), kicking a field goal with just seconds remaining to defeat 2017 state champion Greenback in the semifinals and scoring a touchdown late in the fourth quarter of the title game, a 7-6 win over Cornersville. Waverly finished 10-4 last season, losing in the 2A semifinals to eventual champion Peabody by 14. It was that program's third straight season of at least 10 wins, including two trips to the semifinals. Matt McConnell recently resigned to take over at Westview after averaging 10 wins the past five seasons. Waverly has reached the semifinals three times in program history but never played for a state title. Boldin spent nearly a decade in the Army before working with the University of Tennessee at Chattanooga football program for two years in noncoaching capacities. He then spent two years as an assistant at East Ridge High School before joining the Whitwell staff as an assistant for one season before taking over as head coach. Whitwell principal Teena Casseday said she already has begun the process of looking for the program's next head coach, which will be its 10th in 15 years. "You understand that Randall needs to be there for his family, and we appreciate everything he did here and wish him well," Casseday said. "He was a good young coach who worked well with the kids and built something to where there's a different attitude and a lot more interest. I was there when he told the kids, and you could tell he's a role model for them and that's what we want to find in our next coach. "We opened it up to see who all applies, and there are a couple of assistants that we'll talk to. They have about 50 out for spring practice and a good junior class coming up, so I want to make sure we get someone in here soon to keep the momentum going."